Interesting nut cheese experiment today– I wanted to make a nut cheese from the soaked macadamia and pine nuts that I prepped the night before. I made this two different ways- they both came out very good. I soaked the nuts for about 8 hours although the recipe says 2-6 hours. We drained the nuts and rinsed them well. Next we put them in the blender with water filled to half way of the nuts. We pulsed it but definitely not into a smooth paste. We directly added fresh garlic, olive oil, lemon juice and spices (basil, salt and pepper). We blended it again so that it had a ricotta-like consistency. *For the record, I think I did this part wrong. 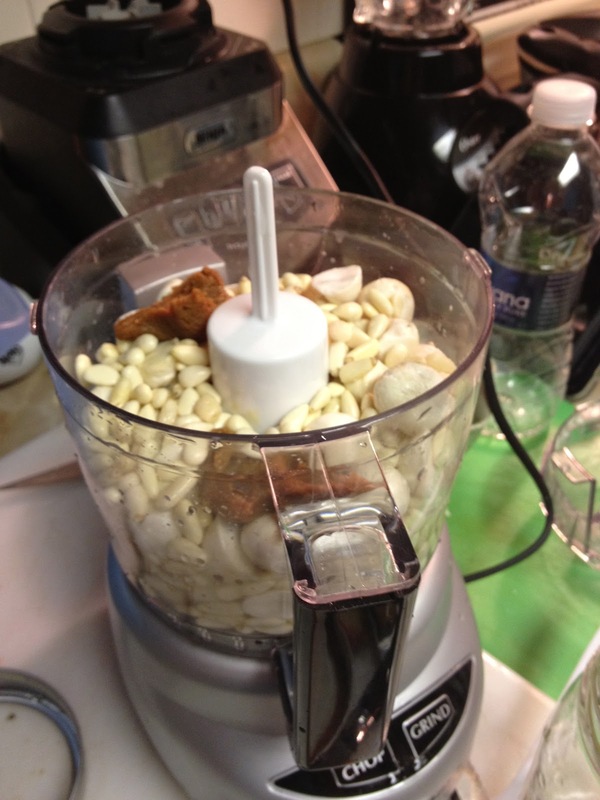 I think I was suppose to ferment the drained nuts first with the miso as shown below. The only thing is- it really tasted good- so good in fact that a day later we combined both cheeses and re-spiced them up to perfection! Next we put them in the blender with water filled to half way of the nuts. (TEST THIS- USE less water and add in if necessary). Add in the MISO and pulse into a ricotta-like consistency. Pour or scoop into mason jars. Cover with cheesecloth to FERMENT and leave at room temperature for 6-12 hours (no more than 12 hours). The cheese should ferment and separate with the (liquid) whey portion going to the bottom. Press the cheese through cheesecloth or a milk bag. The liquid portion release is whey. The solid part is cheese which can now be spiced and refrigerated. *I need to try this experiment again. This is only my second time and there wasn’t any whey this time.